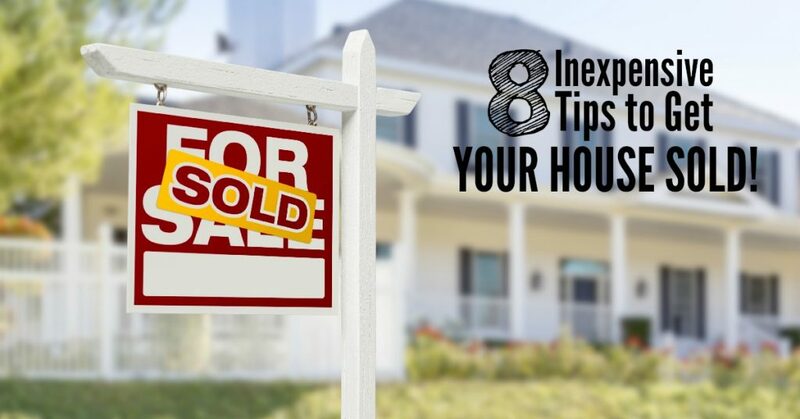 Are you trying to get your house ready to sell? 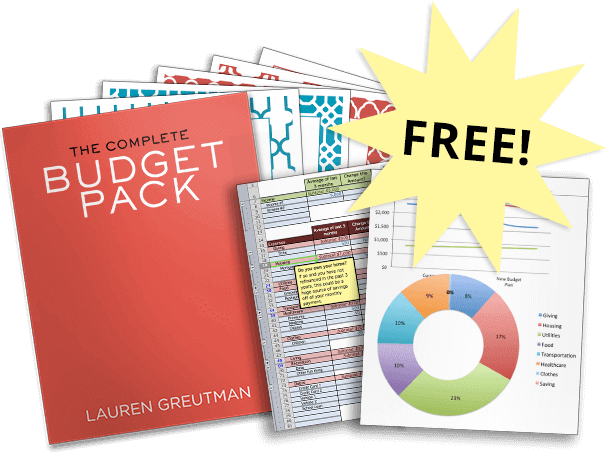 Are you overwhelmed by trying to figure out how to do it without going broke? My husband and I have sold two houses in the past ten years using these principals, and think they will help you in getting your house sold for top dollar! Selling your house can be very stressful, especially if you have kids running around. Spring seems to be the time of year people are either looking to buy a house or are trying to sell theirs. That being said, I thought it would be appropriate to talk about how to get your house ready to sell without spending too much money. Five and a half years ago, after I had just had my second child, we had a huge surprise in job situations and needed to move. We were going to be moving from our 3,200 sq ft home back to family in New York State. This was during the time in our life when we were in over $40,000 worth of debt and struggling to make ends meet. You can read more about my debt journey in my #1 best-selling book The Recovering Spender. We found this out when our daughter was just five-days old. Trying to get a house ready to sell with a newborn was CRAZY, but thankfully with just a few simple tips and updates, we sold our house in three weeks for CASH! 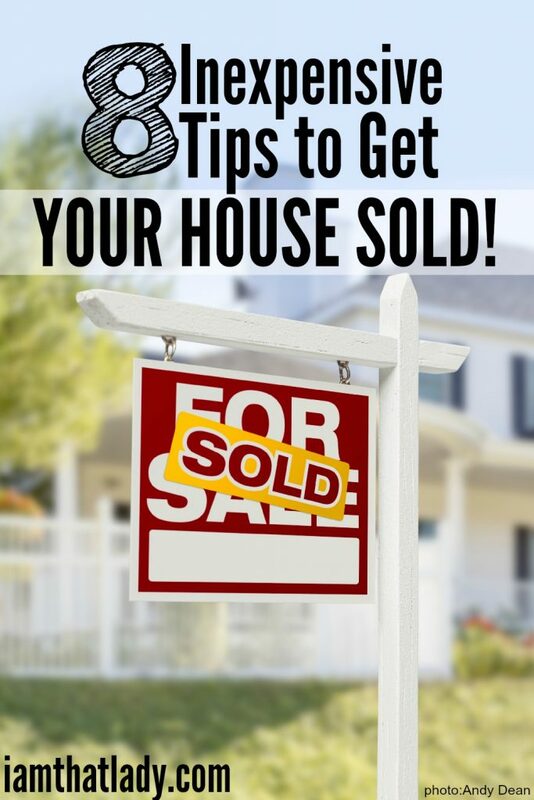 ANOTHER ARTICLE: Here are some other tips on how to get your house sold for top dollar. This is a HUGE deal. Having a quick sale of your house means having a ‘brand new to them’ house. New home buyers will see everything that you don’t. We invested $200 in getting the house professionally cleaned before our first showing. 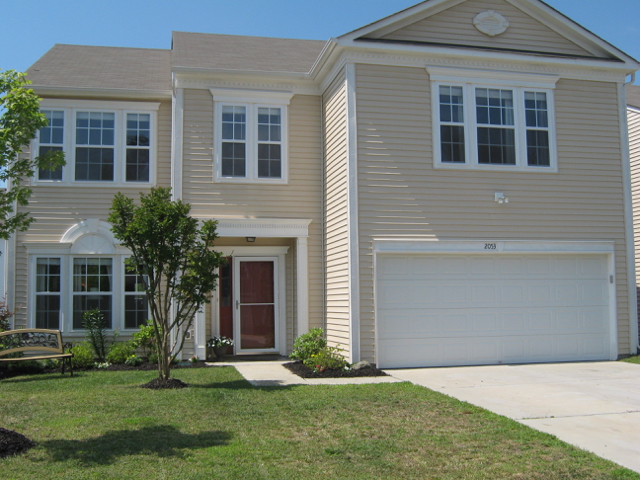 This made it easy for us to keep clean, and the buyers knew they were getting a home that was well taken care of. Have your windows professionally cleaned to give your home a lighter feel. 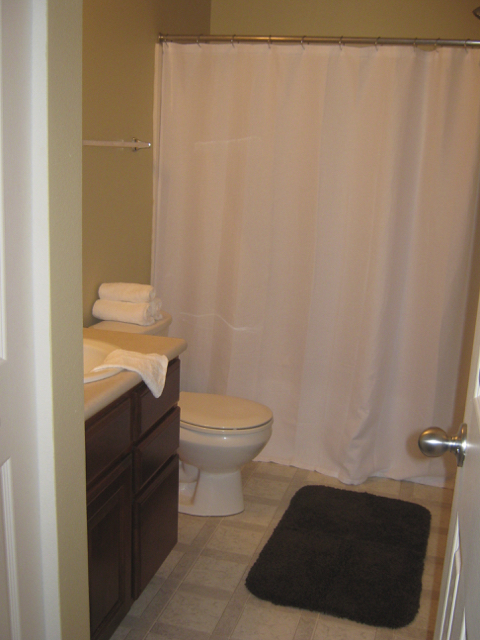 Buy fresh white towels and bath mats for all of the bathrooms in your home. You don’t need to spend a lot of money, and you can often find these items at the dollar store. Lay out your towels on the sinks to give it a spa like feeling, and replace old bath mats with the new ones. Staging your home helps you highlight your home’s strengths, hide its weaknesses and helps it appeal to buyers. It’s important to remove clutter and depersonalize your home. Start selling things from around your house that you no longer need – here are 11 apps that will help you sell the clutter from around your house. Removing the clutter gives your home the feeling of having more space. Depersonalizing your home will give home buyers the opportunity to imagine living in your home and making their own memories there rather than taking a tour down your family’s memory lane. Family Pictures on the wall aren’t necessarily bad, but when your walls are loaded with pictures it can turn a buyer off. Take down clutter from the fridge, kids walls, and as many family pictures as you can. The buyer wants to see themselves in your house. 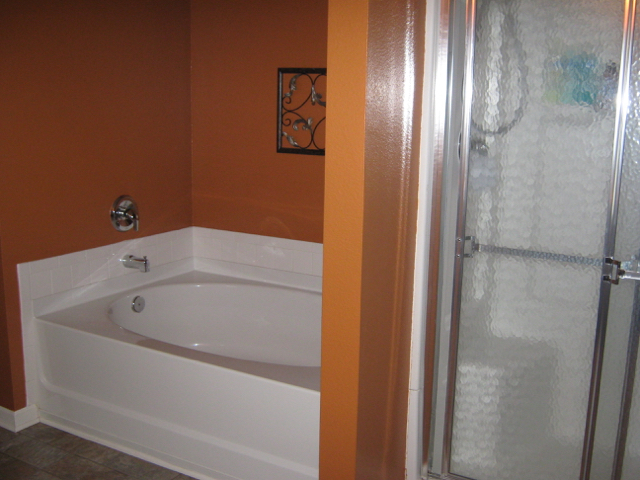 When we were selling our house we had a huge master bathroom. The only downside was that it didn’t have the double sinks most homeowners are looking for. It did have a huge bathtub with a separate shower stall. I decided to play up the appeal of the bathtub and purchased fake rose petals from the dollar store. Each time we had a showing, I would fill the tub and pour the petals into the tub. Then set some candles around the exterior of the tub, making it look like a spa. Instead of people seeing the downside of the missing sink, they saw themselves soaking in a tub after a long day of work. Do not keep your house cold during a showing (unless it is in the summer). You want them to come inside and feel refreshed. If you have central AC, make sure that it is turned on during the showing. If you are selling a house during a colder time of year, turn your heat up a few extra degrees. This will make them feel warm and right at home. Creating a welcome note is another way to add appeal to a buyer. Type up a letter that tells the buyer more about your neighborhood, attractions, and more. If I wanted to sell my current house, I would talk up our neighbors and how we all work together, have a yearly Christmas party, and garage sale. This will add a sense of community and make your house stand out from the rest. Last but not least. Pack up things you don’t need and stage your home. Give your home a clean, minimalist appearance. If you have a dusty bookshelf of old books, pack them up and put the book shelf into storage. Declutter as much as you can before you sell it, and when it sells you will be well on your way to being packed to move. Here are 8 ways to become a reselling rockstar. Here is an easy All-In-One moving Guide that you can use to help you get organized before the big day. Get all of those little or even big problems fixed in the house. Replace heavy bedspreads and tablecloths with lighter fabrics and patterns to continue the softer feel. What is the best way to insure a house that is not being lived in, because they have moved into another residence and are selling the empty house? If you need to relocate before you sell your existing home, you should know that a vacant or unoccupied home may not be covered by your homeowners policy. The institute says insurers typically discontinue coverage on a home if it’s been unoccupied for more than 30 days. Talk to your insurance agent to explore your options if your home will be vacant. What is the best way to insure a house under contract, how do you transfer your home insurance to your new house? Call your insurance agent well in advance of your closing and provide them with a timeline for your move so that you have coverage in place at the appropriate time. Depending on your insurance company, coverage on your old home will generally remain in effect until the sale of the property is complete, as long as your premiums are paid. Make sure you confirm that with your agent. You may also want to have the current owner of the new house add you as an additional insured to protect your interest in the new home for good faith deposit money you have provided to the current owner in case there is a property loss at the new home before you close. Whether it’s for a new job, a relationship, more space or a fresh start, moving is a part of everyone’s life at some point. It’s an emotional time—the excitement, the stress, the celebration. And since everybody moves, everyone can relate. When you’re moving to your next place, you’re not just boxing up pictures, toys, books and clothes. You’re boxing up memories, stories and special moments. It’s stuff, but it’s also your life. It’s everything you own—valuables full of meaning—and it requires you to Handle With Care. I am sure that you will find good way to learn on selling Stodoys handbooks. We are trying to start getting our house ready to sell.It needs quite a bit of work,and my husband thinks we should update the kitchen,but I don’t know if spending all that money is really necessary to get the most for our house.What is your opinion on this?